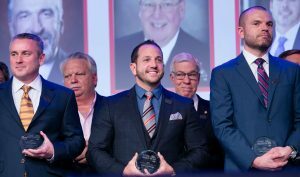 Ryan LaFontaine, Chief Operating Officer at LaFontaine Automotive Group, was named one of four regional finalists for the 2019 TIME Dealer of the Year award last week during the annual National Auto Dealers Association (NADA) Conference. LaFontaine is one of a select group of 51 dealer nominees from across the country that was recognized at the 102nd annual Conference in San Francisco on Friday, January 25. The announcement of this year’s 50th annual award was made by Susanna Schrobsdorff, executive editor and chief partnerships officer, TIME, and Doug Timmerman, president of Auto Finance for Ally Financial. The TIME Dealer of the Year award is one of the automobile industry’s most prestigious and highly coveted honors. Recipients are among the nation’s most successful auto dealers who also demonstrate a long-standing commitment to community service. LaFontaine, 41, was chosen to represent the Detroit Auto Dealers Association in the national competition – one of only 51 auto dealers nominated for the 50th annual award from more than 16,000 nationwide. A 1995 graduate of Our Lady of the Lakes Catholic School in Waterford, Michigan, LaFontaine earned a B.B.A. in automotive marketing and business management in 1999 at Northwood University in Midland, Michigan. LaFontaine’s path after graduation was always clear – he wanted to work for his family’s auto dealership group, which was established by his father, Michael Sr., and mother, Maureen, in 1984. “I started selling cars at age 15 and like my parents, I’ve always had a passion for the business,” he said. By 2008, LaFontaine was named chief operating officer of the LaFontaine Automotive Group, which has since grown to encompass 39 franchises, 20 retail locations, a global vehicles division, a parts warehouse and five full-service collision centers, employing more than 1,300 individuals across Michigan. LaFontaine is credited with being the source of initiatives and opportunities that have led to the rapid growth of the company. His love of the environment inspired him to open four nationally recognized LEED (Leadership in Energy and Environment Design)-certified facilities, including the Gold LEED certified LaFontaine Cadillac Buick GMC of Highland. 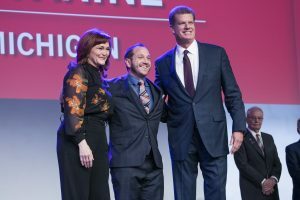 And he is a recognized industry leader, having served as president of the Detroit Auto Dealers Association (DADA) and recently named chairman of the 2018 North American International Auto Show, the youngest chairman in the show’s 111-year history. LaFontaine is also proud to guide the next generation of automotive industry leaders through the LaFontaine Automotive Internship Program, a 12-week immersive experience at his dealerships. And rebuild he did. LaFontaine took that very difficult experience and turned it into something positive. He had heard about a 10-week nationwide fundraising challenge to benefit the Leukemia & Lymphoma Society (LLS). Even though he was fighting cancer and just had twin boys, LaFontaine and his sister, Kelley, decided to enter. “With family and friends at our side, we raised $228,000 for LLS, which was an all-time record,” he said. 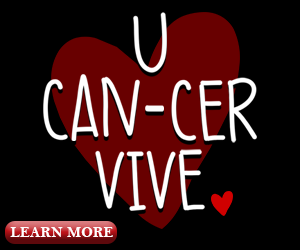 For his efforts, he was named the Leukemia & Lymphoma Society’s Man of the Year in 2010. Other initiatives that LaFontaine supports include: Courageous Persuaders (DADA national video scholarship competition that challenges students to make a 30-second commercial on the dangers of underage drinking and distracted driving); Blessings in a Backpack (provides food on the weekends for children who might otherwise go hungry); Covenant House (transforms and saves the lives of homeless teens); Sparrow Foundation (Lansing, Michigan-based group that aims to provide quality healthcare to all); Angels of Hope (helps families touched by cancer); and many more. Battling cancer and triumphing over adversity has made LaFontaine even stronger. “In so many ways it has defined who I am today as a man, a son, a husband to my wife, Wendi, a father of five and a person of faith,” he said. “They are extraordinary auto leaders who care and go the extra mile to give of themselves to make their communities stronger. Ally is proud to support and celebrate their achievements,” added Timmerman. LaFontaine was nominated for the TIME Dealer of the Year award by Rod Alberts, executive director of the Detroit Auto Dealers Association. He and his wife, Wendi, have five children.